1. 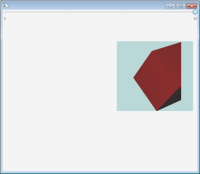 The bounds of the box are converted to an overlay pane. On running, if the box is on the edge of the stage, the bounds are misaligned. After running, moving the slider will re-align the bounds gradually. Eventually, the bounds will stick to the correct position. 2. The direction of the box (the camera is actually translated) is inconsistent. On running, sliding to the left will first move the box to the right, then back to the left. After the box fully entered the stage, sliding to the right will cause a small change in trajectory when the box hits the edge of the stage.